The fabulous foliage of Rex begonias (Begonia Rex-cultorum group) offers a large range of colors, shapes, and textures. The flowers are insignificant, but with leaves like these, who cares? Rex begonias headline the show for months on end in any shade garden, especially when grown in containers. These plants prefer shaded, humid conditions and rich, aerated soil like that found on the forest floor. Too much water and fertilizer is the kiss of death for Rex begonias. Soggy soil and prolonged wet leaves and stems can lead to rot, while highly concentrated fertilizer will burn the foliage. If you keep these points in mind when caring for your plants, it will be smooth sailing. 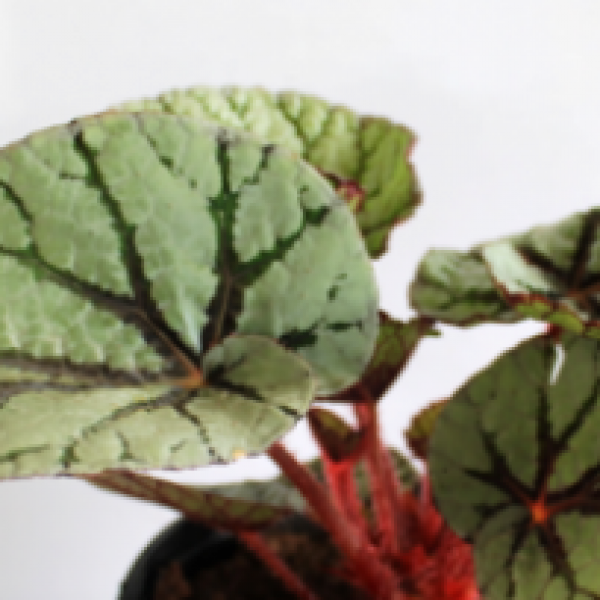 With all the breeding that has gone on with Rex begonias, it’s hard not to find one that strikes your fancy, especially as more and more selections are being introduced with a wide range of colors and intriguing veining and puckering in the leaves. The leaf sizes vary but grow up to 9 inches long and 5 inches wide, while the mounding habit of the plants generally reaches 12 to 18 inches tall and wide—the perfect proportions to create gorgeous and dramatic planting combinations with perennials, annuals, or other tropical beauties. Use Rex begonias as the heart of vignettes, playing off their intricate colors and details. I think you’ll find it won’t be long before the love of begonias is in your blood, too.